'I don't see any wine,' Alice remarked. 'Then it wasn't very civil for you to offer it,' said Alice angrily. Unlike the tea party Alice stumbled into, my Mad Hatter Tea Party certainly had wine. I was torn between making a tea version of sangria and a tea version of mimosas, so I made both! Because I was looking for a caffeine-free alternative to all the other tea drinks at my tea party, this one is technically a tisane. 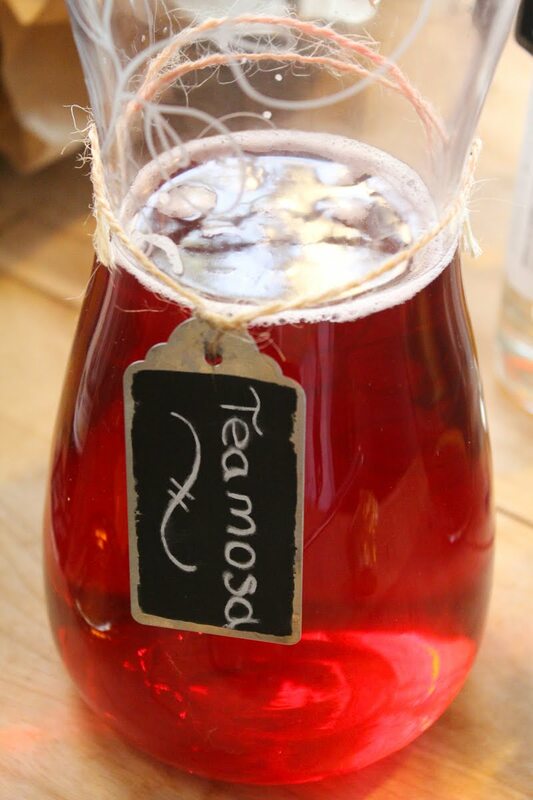 "Tisane-mosa" just doesn't have the same ring to it as teamosa, so I'll stick with the technically-incorrect name. Mimosas are classically made with sparkling wine and orange juice or an alternative citrus juice. I replaced the tang of the citrus beverage with lightly sweetened hibiscus tea. The hibiscus tea has a rich pinkish-red color and can be easily prepped ahead of time. Make the mimosas with a white sparkling wine or with a sparkling rosé for an even richer color. Hibiscus tea is also delicious on its own - it may be more familiar to you under the name agua de jamaica. Consider making double the amount of hibiscus tea to serve as a non-alcoholic option! Cinnamon is a classic combination with hibiscus, and adds a fairly subtle note to the final brew. You could experiment with other whole aromatics, like anise, cloves and cardamom. I prefer my drinks to be not too sweet, so I went with just 2 tbsp sugar. Hibiscus is quite tart - sweeten according to your own preferences. Heat the water until just boiling. Remove from heat and add the sugar, stirring until dissolved. Stir in the hibiscus flowers and the cinnamon stick. Let brew for 15 minutes, then strain into a 60-oz pitcher. Cover and chill until ready to serve. Pour in the sparkling wine. Serve in champagne glasses garnished with lime wedges. Check out more colorful & geeky cocktails and drinks, like this bright blue Dota sangria or this fizzy cocktail inspired by murder suspect Ms Scarlett.